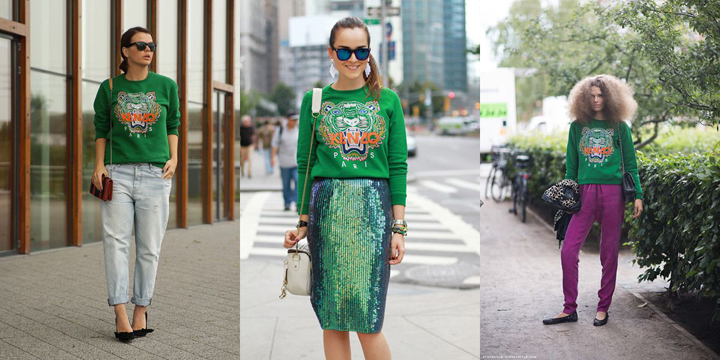 Continuing sweaters obsession I can’t skip obvious street style trend – green Kenzo jumper. I’ve never been a huge fan of sweaters but now a time has come when I just can’t resist them. With hoods, without hoods, maxi size, and normal size – they just seem ideal daily outfit, especially when they are green and…Kenzo. The first time I noticed it on Russian it girl Elena Perminova. It looked so good on her with jeans shorts (of course, even the ugliest thing would look amazing on her)! After a while I started noticing that Kenzo became a must have. Everyone was/is wearing these colorful sweaters. Ones wear them with jeans, others with skirts – they look stunning however you wear it. It’s amazing how one green sweater can make your outfit look breathtaking. 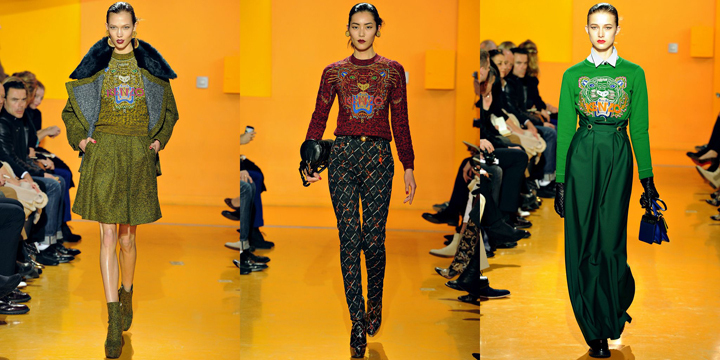 Kenzo absolutely has become one of the favorites in street style blogs. Looks like green is the new black and sweater is the new jacket.